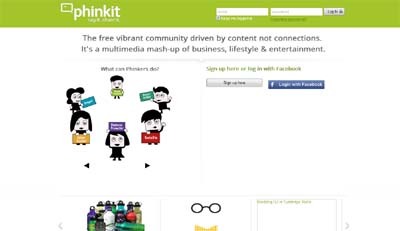 Phinkit.com is a new-generation, free social multimedia site. The ‘multi’ not only denotes Phinkit’s capability for striking visuals and video content, but also the ability to conveniently share your messages across Twitter, Facebook, LinkedIn and Pinterest. The real difference is Phinkit is designed to get yourself noticed without the need to amass connections or followers. It’s a creative community where the value is in the quality of the interactions you have with other members. Plus the support system is entirely geared up for helping people be more creative with ideas, concepts & interaction. Simply put, Phinkit makes promoting yourself and your business online more of a fun and rewarding experience. Phinkit is entirely driven by value. Some other social networks suffer from the sheer volume of noise, unoriginal & spam messaging and a relentless focus on building numbers of people in the hope of getting a wider reach. Phinkit takes these issues head on and has a number of mechanisms to ensure you find the quality of content and interactions you’re really after. One of the Phinkit members described it as, “Facebook’s cooler, more sophisticated cousin”!